It was an honour to be invited to the participate in the inaugural World Travel Writers’ Conference, which took place in the Maldives on 17 and 18 September 2017. The conference was held within the Orchid Hall at the Bandos Maldives resort, a 10-minute boat journey from Velana International Airport on Male Island, the Maldives’ principal entry point for air travellers. A footprint on the sand on Bandos Island in the Maldives. The Maldives’ Minister of Tourism, Mr Moosa Zameer, was one of the speakers during the conference’s opening ceremony. Subsequent keynote speeches and panel discussions led to debates about the role of travel writing on tourism. Blogger Elizabeth Carlson discussed the topic Sharing Experiences and the Art of Storytelling before Dr Sunny Umar talked about the role of the Maldives’ archaeological history in driving cultural tourism. Travel blogger Yulia Safotdinova on Bandos Island. After lunch in Bandos Maldives’ chic Koon Thai restaurant I took to the stage to participate in a panel discussion entitled Storytelling Through Digital: every travel experience starts with a search. That lively discussion raised points relating to the impact of traditional travel writing and blogging on people’s decisions on where to book holidays and breaks. After Gina Samarato talked about bringing a destination to life through use of immersive technology Ahmed Ijaz gave a keynote speech on Maldivian travel trends. The final keynote speaker of the first World Travel Writers’ Conference was Janet Newenham, who talked about the role of travel writing in retaining memories that would otherwise be gone. A networking session followed. Travel Blogger Janet Newenham modelling clothing from Primark on the beach at Bandos Island. The conference was organised by Maldives TV, the islands’ first international television channel. Maldives TV was launched officially on 9 March 2017 at the ITB Berlin, the world’s largest travel trade fair. Run by the Maldives’ Public Service Media, the channel, which is broadcast in English, transmits content about Maldivian culture, heritage and lifestyle, as well as tourism related subject matter. Downloadable content is available online, making the channel a useful resource for people planning travel to the Maldives. A stroll in the Maldives. Participating in the World Travel Writers’ Conference gave me an opportunity to spend a few days getting to understand why the Maldives are such a popular holiday destination. The country consists of 1192 islands scattered across atolls in the Indian Ocean, south-west of India’s southern tip. The islands are known for the stylish accommodation available at upscale properties such as the Kandima Maldives and Coco Resorts. Affordably priced guesthouses, such as those on Huraa Island, are opening the Maldives to a new group of travellers. Yulia Safotdinova and Allison Green, participants in the World Travel Writers’ Conference. From my base on Bandos Island I took a sunset cruise, which provided an opportunity to see dolphins swimming alongside the boat, plus a dusk fishing trip. The Bandos Maldives’ Dive Centre offers PADI courses and I was able to walk into the sea to scuba dive and snorkel on the house reef. Those experiences allowed me to get within an arm’s length of creatures including a hawksbill turtle, puffer fish and a moray eel. At the PADI-accredited Dive Centre at the Bandos Maldives. The World Travel Writers’ Conference concluded with a gala dinner held at the Adaaran Select Hudhuran Fushi resort, on North Male Atoll, on 18 September. The reception was held on a beach of soft white sand, where cocktails were served. After helping ourselves to an expansive buffet featuring Maldivian and international cuisine, the evening event then provided an opportunity for participants and organisers to mingle, chat and dance together. The conference was deemed a resounding success and a 2018 edition is being planned. Fishing at dusk on a boat on the Indian Ocean. 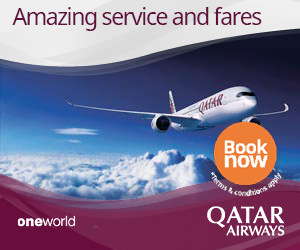 I flew from London Heathrow to the Maldives, via Doha, with Qatar Airways. 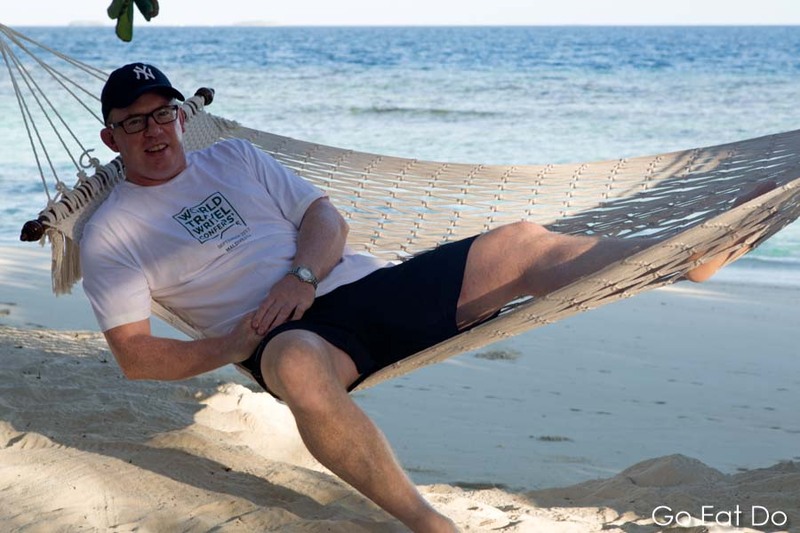 Enjoying swinging in a hammock at Bandos Maldives. See the Visit Maldives website for tourism related information and insights. Previous Post Previous Article: Mr Petit: the most instagrammable food in Newcastle? It was a great event. I attended the Maldives Tourism Board press conference at WTM London, Tom Grond was there too. It looks like a lot is happening in the country and that we may all go back soon! Thanks Claudia, I certainly enjoyed my visit to the Maldives and had the impression that there’s plenty more to do there. Would I like to go back? Absolutely! Thank you Gina, I thought the attendees were a lot of fun to spend time with. And what a setting! Hoping to meet again! Hope I get invited again. I loved the diving there! It was also great meeting you. See you in a future trip! It would be a pleasure to spend time with you again. You were great company over meals! It was wonderful to get out to the Maldives and, yes, the diving was spectacular. I’d love to return to do more. Maybe see you there? Looks like it could be a great location for me to check out. I’d certainly recommend it to anyone interested in photography and activities in or on water.